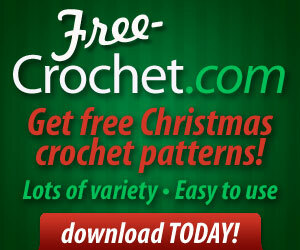 Get free crochet Christmas patterns! 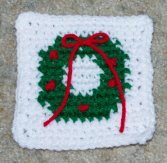 Free-Crochet.com wants you to be prepared! for your own home or a thoughtful gift for a loved one. enjoy the Christmas season which is upon us. 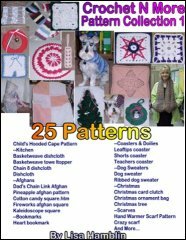 Numerous links to toy patterns. Print some Snowman Paper courtesy of BillyBear4Kids. I am trying to find a pattern for crocheted knee warmers /knee cap covers for arthritic joints. They have a gusset covering the knee cap and are not too tight above and below the knee. 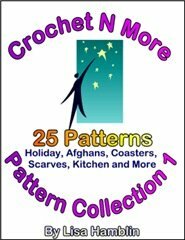 I can find numerous knitting patterns but have had no luck finding a pattern to crochet. I hope some-one is able to help me. Thank you. and make them to fit only the knees. The single crochet stitches would make for a tight weave. You could also chain the length of the knee warmer you wanted... work a single crochet in the second chain from the hook and in each remaining chain. Then keep working rows of single crochets in the back loops only to get a ribbed texture. Work enough rows to fit around the knee and then sew the first and last rows together. 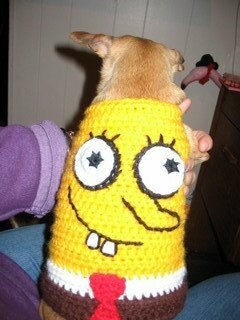 the only thing with this one would be the ribbing on one end and no ribbing on the other. The heel can go right on the knee though. Omitted a link that is now broken. I said, "I will guard my ways, that I may not sin with my tongue;' I will guard my mouth as with a muzzle, while the wicked are in my presence." And my tongue shall declare Thy righteousness and Thy praise all day long. Let my cry come before Thee, O Lord; Give me understanding according to Thy word. Let my supplication come before Thee; deliver me according to Thy word. Let my lips utter praise, for Thou dost teach me Thy statutes. Let my tongue sing of Thy word, For all Thy commandments are righteousness. Even before there is a word on my tongue, behold, O Lord, Thou doest know it all. So also the tongue is a small part of the body, and yet it boasts of great things. Behold, how great a forest is set aflame by such a small fire! And the tongue is a fire, the very world of iniquity; the tongue is set among our members as that which defiles the entire body, and sets on fire the course of our life, and is set on fire by hell. "DESTROY GOSSIP BY INGNORING IT." Insert hook in next ch, yo, draw a loop through (2 loops on hook), yo, draw through one lp on the hook (2 loops still on hook), yo, draw through both loops on the hook. Buttonholes are easy to make in crocheted fabric. I like to make them using single crochet stitches on the row that contains the buttonholes. 1. Decide where you want the buttonhole and crochet up to that point. 2. Make enough chains to accomodate the size of the button you want to add. 3. Skip the same number of stitches as the chains you made in step 2. 4. Continue crocheting past that point. Buttonhole made... now all you have to do is sew on your button in the appropriate place. do you have number 73? Thank You for Your Many Wonderful Ideas, and your Excellent teachings... I just found you, by accident, and so glad I did. Thank you for all Your hard work in keeping this site going. Great Job ! Thank you for your design. I am making the baby beanie. On rows 4-12 it says "Ch3 (counts as dc for this space.) (Dc bet next 2 sts) arount. Do you Chain 3, then Double crochet between next 2 stitches, then chain 3, double crochet between next 2 stitches around? Or do you leave out the chain 3 after the first one? Just work the double crochet between the next two stitches around. This site is wonderful, especially for new crocheters like myself, I don't know about others newbies, but boy can this be a little confusing. thanks for the wonderful site. Hi, my name is Marlene and I need to know something about a pattern I printed out for the toilet paper doll cover, what is FL'S AND BL'S IN THE PATTERN SO I CAN WORK THE INSTRUCTIONS. ALSO REPOSITION MARKER? AND ALTERNATIVE RNDS . THANK FOR THE INFORMATION, HAPPY HOLIDAYS. MARLENE . Fl and Bl are front loop and back loop. 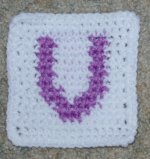 Reposition marker... that means you use a stitch marker or piece of yarn to mark your place and move it when indicated. Alternate rounds... means you repeat those rounds over and over. RND 19-27: Alternate Rnds 17 & 18, ending in Row 17 (chain 4 at end). means you work round 17, then round 18, then round 17, then round 18... ending with round 17. You alternate those two rounds for rounds 19 through 27. The Peaches and Cream yarn works well... it's a worsted weight cotton yarn. The reason I use cotton is because acrylic yarn isn't absorbent like cotton yarn. 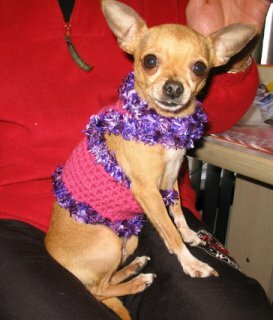 where can the crochet patterns for Jorja's, Not-E-Nuff, Kacie, and Goliath dog sweaters be found, I have searched the internet for days trying to find sweater patterns for a 6 week old chihauhau puppy, but without any luck. I would appreciate it if you could e-mail me back. Thank You, Letha in Oregon. This pattern is adjustable for any breed. I haven't been able to locate a pattern like you described using cards. and thought you might like it. For Round 1, I think I should have listed to join with a slip stitch at the end. I'll make that change on the pattern page shortly. Round 1 is worked in the ring... Round 2 begins in the stitches of Round 1.
your add says free crochet patterns! false advertising!!! 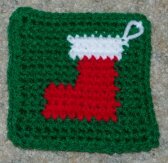 I am a Christian, a beginner in the crochet world....wow, you just burst my bubble...I guess I'm outta luck and I can find other crochet sights! Just curious... where did you see an "ad"? note: I think she accidentally clicked on the donation button on the free patterns page. Sorry, individual patterns not available. 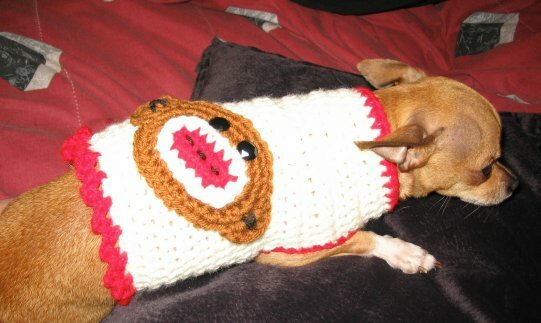 The Dog Sweater pattern is adjustable for any breed. I do not have written patterns for different sizes. The alteration instructions are on the pattern page. The pattern is pretty straight forward and doesn't use complicated stitches. "On Friday we're having a quiz on the moon." A young couple moves into a new neighborhood. The next morning while they are eating breakfast, the young woman sees her neighbor hanging the wash outside. "That laundry is not very clean," she said. "She doesn't know how to wash correctly. Perhaps she needs better laundry soap." One of my students could not take my college seminar final exam because of a funeral. "No problem," I told him. "Make it up the following week." That week came, and again he couldn't take the test due to another funeral. "You'll have to take the test early next week," I insisted. "I can't keep postponing it." "I'll take the test next week if no one dies," he told me. By now I was suspicious. "How can you have so many people you know pass away in three weeks?" I asked. Young Boudreaux applied for an engineering job way, way up north in Shreveport. A local man applied for the same job and both applicants, having the same qualifications, were asked to take a test by the department manager. Upon completion of the test, both men missed only one question. The manager went up to Boudreaux and said "Thank you for your interest, but we've decided to give the local man the job." Boudreaux said "Why you gonna be doin dat sir, we both got 9 questions right?" "That's very fair, your honor," the husband said. "And, every now and then I'll try to send her a few bucks myself." His girlfriend's father was interviewing young Charles. "So," said that impressive personage, "you want to be my son-in-law, do you?" "Not particularly," said Charles tactlessly, "but if I want to marry your daughter I haven't much choice, have I?" Three women, obviously old friends, had just finished having dinner at the table next to me. When the waiter came with the bill, one said, "Give it to me." "No. You got it last time," said another. "It's my turn." The waiter stood there, unsure of what to do -- until the third woman said, "I'm the biggest tipper." Mr. Gable had a leak in the roof over his dining room, so he called a repairman to take a look at it. "When did you first notice the leak?" the repairman inquired. Mr. Gable scowled. "Last night, when it took me 2 hours to finish my soup!" When employees of the restaurant where I work attended a fire-safety seminar, we watched a fire official demonstrate the proper way to operate an extinguisher. "Pull the pin like a hand grenade," he explained, "then depress the trigger to release the foam." Later, an employee was selected to extinguish a controlled fire in the parking lot. In her nervousness, she forgot to pull the pin. 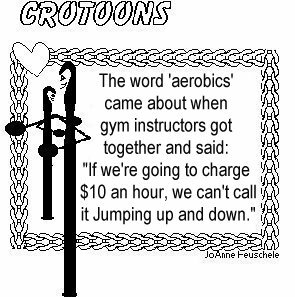 Our instructor hinted, "Like a hand grenade, remember?" In a burst of confidence, she pulled the pin—and hurled the extinguisher at the blaze. A goober notices that she's low on gas so she stops at the gas station. While she's pumping her gas, she notices that she locked the keys in the car. So when she goes inside to pay, she asks the attendant for a hanger so she can attempt to open the door herself. She goes outside and begins to jimmy the lock. Ten minutes later, the attendant goes outside to see how she is faring. The trendy dresser fancied himself quite a ladies' man, and was delighted to find a note pinned inside a new shirt. It contained a girl's name and address, and asked the recipient to send a photograph. How romantic, he thought to himself, very taken with the idea of this mystery woman so eager to meet him, and promptly mailed off a note and a photo. "Thanks for writing. I was just curious to see what kind of guy would buy such a goofy shirt."